A tribute to Blessed Alexandrina - a living miracle of the Eucharist. Our Lord speaking to Blessed Alexandrina Maria da Costa, 22 nd November 1937. The desire of Jesus to see a widespread knowledge of the life of Blessed Alexandrina Maria da Costa of Portugal is starting to be fulfilled, as devotion to her grows steadily throughout the world. One of the great mystics of modern times, a ‘victim soul' chosen by Christ to suffer in atonement for the sins of humanity, she appears set to become an important and well-loved saint in the Universal Church. She was unable to go to Fatima, but the Virgin Mary granted her the grace to understand and live the messages in the most perfect way, intimately uniting herself to the desire of the Blessed Virgin. By offering her passion in this way, Alejandrina became a victim soul for love of the Eucharist and the consecration to the Immaculate Heart, which are fundamental messages of Fatima. 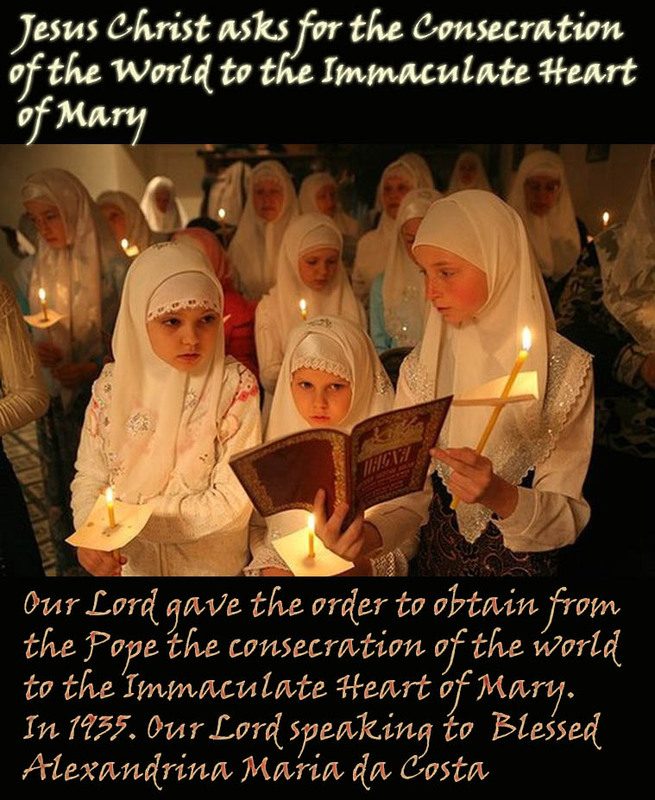 During this period, she was entrusted by Our Lord with the propagation of the message of Our Lady of Fatima. After she had received Communion one morning Jesus reportedly told her, "Through the love which you have for my blessed Mother, tell your spiritual director that as I asked Margaret Mary [St Margaret Mary Alacoque] for devotion to my divine Heart, so I ask you to urge the consecration of the world to the Immaculate Heart of my Mother." From that day, Alexandrina offered herself as a victim to achieve this expressed wish of Our Lord. Alexandrina prayed and offered many sufferings that the bishops would ask the Holy Father for the consecration of the world to the Immaculate Heart of Mary. "As a sign that it is My Will that the world be consecrated to the Immaculate Heart of My Mother, I will make you suffer My Passion until the holy Father has decided to implement this consecration."